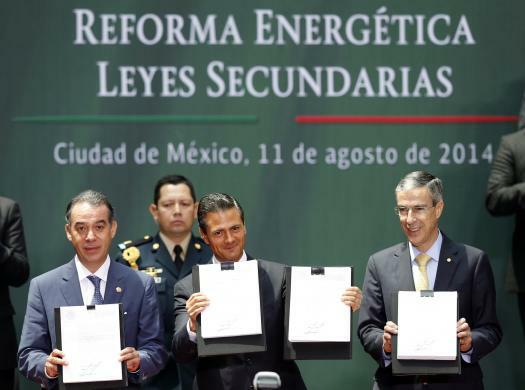 Eight months after constitutional amendments were introduced to reform Mexico’s oil and gas, and electricity sectors, Mexican President Enrique Pena Nieto took a historic step and signed energy reform bills passed by the Congress of the Union into law. The reforms are largely focused on opening those sectors to foreign private sector actors to bring new investment and capability. Mr. Nieto has ambitiously estimated the new encompassing framework will successfully attract $50.5 billion of investment from exploring, producing and refining oil in Mexico by 2018. The standard 30 percent corporate tax rate will be maintained and paid to the Ministry of Finance and there will be a sliding scale for royalties paid to the Mexican Petroleum Fund. Petroleos Mexicanos (PEMEX), the state owned oil company, was formed in 1938 to replace the U.S. and British oil companies, and has held a monopoly since as stated in the Mexican constitution.PEMEX, though, had become synonymous as being inefficient, slow to adapt to new opportunities, not maintaining infrastructure sufficiently, and a corrupt organization. The reforms are also being touted to stimulate joint ventures with PEMEX to demonstrate more efficiency and technological expertise to develop unconventional resources, while at the same time being able to compete with PEMEX. PEMEX’s oil production has tailed off the past decade, and the national output has fallen to tenth globally, according to the U.S. Energy Information Agency. The drop-off has thus far bottomed to about 2.4 million barrels per day (bpd), according to the International Energy Agency; this is compared to 3.4 million bpd in 2004. The large fields such as Cantarell and the KMZ complex have fared the worst. Mr. Nieto aspires to ensure Mexico stays a gross oil exporter and mentioned the reforms will boost production 20 percent by 2018 and to 2004 levels by 2025. Mexico, the world’s 15th largest economy ($1.26 trillion) according to the World Bank, detailed its redrawn distribution of energy assets, known as Round Zero. PEMEX will have its assets trimmed but will still maintain 83 percent of the country’s proven and possible reserves (26 billion barrels, of which 12.5 billion are proven). PEMEX requested for the Comisión Nacional de Hidrocarburos (CNH), the country’s regulator, to allow it to hold 31 percent of prospective reserves, but a 21 percent stake (estimated to tally 23 billion more barrels) was allocated instead. Under the reforms, PEMEX does intend to set up 10 different joint ventures with the private firms, to bring the attributes mentioned previously, among them plans for deep-water drilling (with firms such as Shell and Exxon) in the yet to be developed Gulf of Mexico. “Pemex will continue to be the big business of Mexico,” said Energy Secretary Pedro Joaquín Coldwell. In that vein, the PEMEX president wants to ensure new partners, and competitors, will not recruit its skilled employees. The next round, Round 1, will describe the opportunity for international investors to bid on new blocks. The government has identified 109 blocks covering over 14 billion barrels of prospective reserves, including a mix of both onshore and offshore areas, and covers a total of 28,500 square kilometers. Those blocks specifically need the advanced technology and deep pockets for investment, which PEMEX has been lacking. The tender process will be organized by CNH and will be conducted at an estimated date between May 2015 and September of that year. In addition, there will be the rights for 60 fields of proven and probable reserves equaling nearly four billion barrels. Potential investors have also been provided specifics of the new fiscal regime that will impact any contracts and production sharing contracts. “Mexico has created a solid framework to make the energy sector more competitive and attractive to private investment,” said Shell Mexico President Alberto De La Fuente. Pacific Rubiales, Latin America’s largest non-state oil company, has made its interest known of being a player in the newly opened industry. An under the radar aspect to watch unfold with North American companies is if the Mexican reforms will change the energy industry dynamic under NAFTA. Three additional elements that could adversely stymie President Nieto’s ambitious goals worth watching are if companies actually are ready to commit without first success stories from the nascent reforms, geological estimates are not accurate, and the effects of the drug cartels, as different plays are located in violent territory. Perhaps the sector that does not grab the headlines, but is extremely important, is the reform of the electricity sector and state owned Comisión Federal de Electricidad (CFE). Some have stated that the biggest winner is cheaper electricity. The Mexican electrical power intensive industry currently faces challenges in the cost of electricity, which relies heavily on diesel generation – sometimes reaching 80 percent higher costs than the U.S. Opening up the sector to new opportunities for investment could lower bills and make manufacturing more competitive. There are initial plans that can build gas pipelines from the U.S. to Mexico to utilize cheaper gas for power plants. In addition, Mexico is believed to be home to the world’s sixth largest reserves of shale gas. Bloomberg New Energy Finance stated investment in clean energy in Mexico totaled $1.3 billion in the first half of this year, compared to $1.6 billion in the whole of 2013. And more increases in wind and solar development are expected in the next couple years. A hidden piece of the reforms leaves room for a mechanism to be established for more renewable energy independent power producers to negotiate power purchase agreements and harness Mexico’s bountiful clean resources, which in turn can also bring down the cost of electricity, as the price of renewables continues to decrease. While the described results sound great, the sweeping reforms are not embraced nationally – far from it, actually. There has been lots of social uproar from citizens and politicians alike claiming this is a handout similar to the banking and communication reform, the regulatory process is not strict enough, the environmental concerns have not appropriately been addressed, and the measures do not go far enough to ensure Mexicans benefit from the new oil wealth. Many believe the national legacy has been betrayed, as it was ingrained in the constitution. President Nieto confronted those claims stating “the reforms preserve and assure our national prosperity.” According to a poll published August 6 in the Reforma newspaper, 40 percent of Mexicans do not agree with Mr. Nieto’s plan. After California and Mexico signed a MOU near the end of July to combat greenhouse gases, there is speculation both will work together to form a joint cap-and-trade system. It is worth wondering if hydrocarbon companies are using this possibility in their financial modeling for possible bids and, if so, how that may change their involvement. Time will tell which factors win out and the success, or lack thereof, of the new reforms that have promised a great deal.